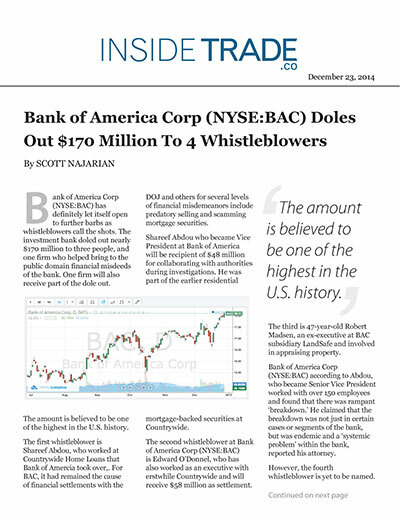 Bank of America Corp (NYSE:BAC) has definitely let itself open to further barbs as whistleblowers call the shots. The investment bank doled out nearly $170 million to three people, and one firm who helped bring to the public domain financial misdeeds of the bank. One firm will also receive part of the dole out. The amount is believed to be one of the highest in the U.S. history. The first whistleblower is Shareef Abdou, who worked at Countrywide Home Loans that Bank of Amercia took over,. For BAC, it had remained the cause of financial settlements with the DOJ and others for several levels of financial misdemeanors include predatory selling and scamming mortgage securities. Shareef Abdou who became Vice President at Bank of America will be recipient of $48 million for collaborating with authorities during investigations. He was part of the earlier residential mortgage-backed securities at Countrywide. The second whistleblower at Bank of America Corp (NYSE:BAC) is Edward O’Donnel, who has also worked as an executive with erstwhile Countrywide and will receive $58 million as settlement. The third is 47-year-old Robert Madsen, an ex-executive at BAC subsidiary LandSafe and involved in appraising property. Bank of America Corp (NYSE:BAC) according to Abdou, who became Senior Vice President worked with over 150 employees and found that there was rampant ‘breakdown.’ He claimed that the breakdown was not just in certain cases or segments of the bank, but was endemic and a ‘systemic problem’ within the bank, reported his attorney. However, the fourth whistleblower is yet to be named. The aftermath of whistleblowers collecting such settlements however, has not been perceived as a healthy trend for the banking system. Bank of America Corp continues to wrangle with various legal issues following the absorption of Countrywide Financial Corp. in 2006. Besides being one of the first to draw up the settlement plan with Department of Justice, it also led to the indictment of several banking peers. Each of them also chose the settlement way to emerge from the massive financial irregularities filed against them!